Michael Ajerman is an American artist who works from his studio in Brixton in South London. 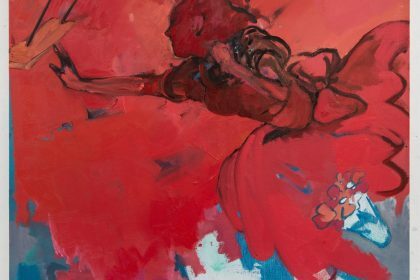 Like many artists who have taught and studied at the renowned Slade School of Art – including Paula Rego, David Bomberg and Lucian Freud- he uses expressive paintings to capture psychologically charged figures and situations. His figures emerge from disquieting domestic settings, often bearing sexualised overtones or bringing dark humour to their tableaux. Within the thickly painted portraits, Ajerman creates what he terms “images that point to certain directions” and which can provoke in his viewers “multiple sensations over multiple viewings”. Ahead of his upcoming solo show at HemingwayArt in Oxford, he talks frankly about his latest series of paintings. Can you tell me about the title, ‘Far From Tahiti’? The title is playing with the notion of the artist in some kind of celestial paradise. Gauguin felt that he needed it to create his oeuvre and in the end — well, it killed him. Who are the figures and creatures in your paintings? Where do they come from? What do you paint from – props? Photos? Imagination? The figures are usually based on individuals, at times they become conglomerates-sometimes they stay close to their sources. ‘Portrait of a Woman’ comes originally from a Vuillard painting, although the knife has been added, almost as a warning. The ‘creatures’ you are referring to are all derived from physical objects. These trinkets are things I enjoy looking at and in the studio they are items I use to help create an image. I’ll use anything to get the painting done; a sitter, working drawings, other people’s paintings, an object, photographs, or from my head. The drive is to get it to work or make the idea tangible – and that to me means by any source necessary. What do you want your viewer to feel in front if these images? The most important thing is that there IS a reaction. Controlling the reaction in my opinion is going into the area of propaganda, I have no interest in this. Having an uncontrolled reaction means that there can be multiple sensations over multiple viewings. I once went to see Rembrandt’s ‘Jewish Bride’ painting, which I always though was a juggernaut of a painting. I’m standing there feeling good in its presence. I wound up talking to the couple behind me. The woman thought the painting was disgusting for she felt that the woman was being felt up. SO go figure. Can you tell me about the narratives you construct? Some of them remind me of Paula Rego’s sinister stagings (another Slade artist)…. I don’t think I create narratives, I think I create images that point to certain directions. A variety of directions over a variety of work. Sinister can be part of some of it, but it isn’t all of it. I think Rego does this too. And was never afraid to show her teeth. And if that reminds you of my work, or some of my work, I now take it as a compliment. Can you tell me about your time at the Slade? Did this change your way of working/painting? It was wonderful and magical and insane. The misconception about the Slade is that it is some kind of mecca of representational figurative painting. In my experience, if you were working that way – you had to fight and defend why you were working that way. If you pulled through, you were already half way there. Is your American heritage important to you? Why/how the heck have you ended up in London? It’s what I am, I used to think it wasn’t important or apparent, but I know it is now. The cradle of the best and the worst. I do think being away helps me see it, America – clearer. I came to London on an exchange program through the New York Studio School. I had a tutor who thought the Slade would be good for me. It seemed like a good idea. Then went back to do my Masters Degree. When I finished, there was some interest in my work and I was offered a job, so I though, oh I’ll do this for a year or two. That was over 10 years ago, and since graduating from the Slade, Michael Ajerman has exhibited his work internationally, holding solo shows in the UK, Italy, USA and Israel. Notable exhibitions include Fisherman, Strawberry and Devil Crab (2010) and Squash (2013) at Transition; Heads of Tails at HemingwayArt; Inatteso/Unexpected at Marco Rossi Arte Contemporanea, Milan, Italy, and Glossolalia at Toomey-Tourell Gallery, San Francisco, USA. He has also been included in numerous group exhibitions including the 2015 East End Painting Prize at the Rum Factory, London; Kunskog at 500 Dollars, London; East Wing Collection 8 at the Courtauld Galleries; The Painting Room at the Transition Gallery, and Bomberg’s Relevance at the Ben Uri Gallery. He received the William Newman Memorial Painting Prize in 1996, the Royal Academy’s British Institute Award in 2003, and the Manhattan Graphic SummerInk Scholarship in 2012.